Well…today can probably best be described as a failure. Not a colossal failure – I did get to Yangshou. Just…that was about all I managed to achieve. In hindsight I really should have taken the bamboo tour, but at least I know for the future. The bus station is one of the most chaotic things I’ve ever seen in China (and that’s saying something). In some confusion (to my discredit) I said yes and one guy took me to an empty bus, told me the price (more than 3 times what I’d been quoted online) and said it would leave at 10. It was currently ten to 9. I walk off saying I will be back closer to the time (complete lies) and as I’m leaving the area, get accosted by a woman asking Yanshou. Still have no idea what happened, but the guy that had taken me to the first bus started talking/arguing with her, another guy’s trying to herd me off, and the woman’s trying to explain the price. Eventually I get on her bus on the grounds that its leaving now, there’s other people on it, and its (slightly) less expensive that the other bus. It was clearly going to Yangshou. 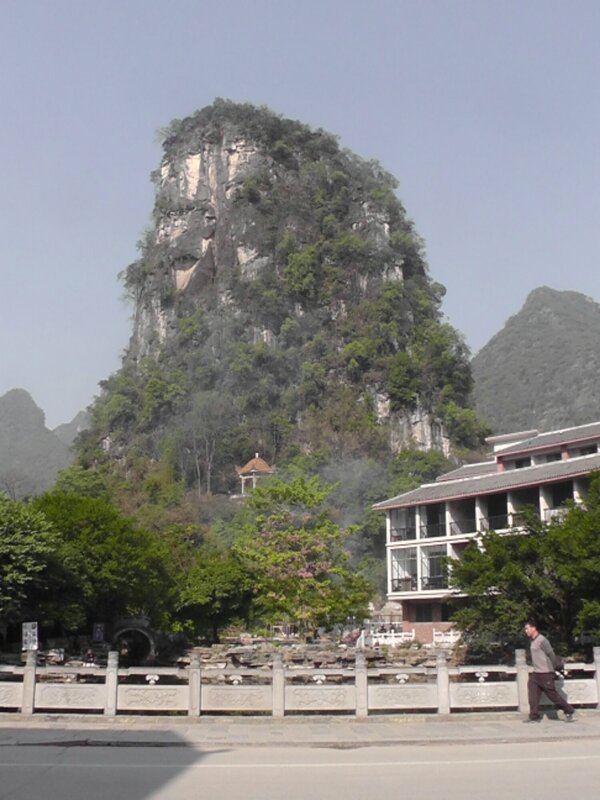 I don’t know enough about buses in China but we spent a good half hour trawling around parts of Guilin with the woman halfway out the door calling ‘Yangshou’. Within that half an hour the bus went from a few people to nearly full, and then we seemed to finally head on out. The guides I’d read had said the bus trip took about an hour. Mine easily took 2, and when the woman hussled me off, it was about 11am – standing at a petrol station next to a woman holding a laminated Yangshou map/tour sheet who spoke no English. We eventually managed to hash out some kind of understanding, and I headed in the direction her map suggested would have a tourist information. Thankfully Yangshou is small, and half the shops are aimed at tourists, so it wasn’t hard to get a map from one and then follow it to the river. When I get there, an elderly woman is on me immediately asking if I want a bamboo boat ride. I am interested, but I’m hungry and in no mood to haggle just yet, so wave her off and keep walking. Thing about Yanshou bamboo boats? They’re persistent. I discovered she’d been trailing after me when I hit a dead end 5 minutes later, and tried to express (admittedly this time with more anger) that I wasn’t interested right now. It wasn’t until a man who did speak English came along, and gave me some advice on where to go to get food, that she finally gave up. Wandered in the opposite direction at his advice, as he said you could walk for quite some time if you went North. That turned out to be a bit optimistic, but nice walk (and at least 3 more bamboo boat offers). End up in a restaurant called The River View which had a pretty good menu at the right price. My stomach was finally settled enough that I could eat an actual meal – and it was the nicest thing I’d had in China at that point. Once that point of order was settled, I walked down the steps so I could walk along the actual river and not just the main road. Along the way I got hit with the most persistent of the bamboo boaters yet. I was actually interested, but he started with a price that was ridiculous. I tried to haggle (a little half heartedly if I’m honest) and he didn’t seem interested, so I accepted defeat and walked on. …Only this guy was desperate for the sale. He kept following me, offering prices slightly lower trying to get me back. I came to a section of the river you could only cross by going over some rocky stepping stones (fun in a skirt), and figured he would give up once I’d crossed them. Nope. Still following, still lowering the price. I shook my head, rejected him again, and kept going. Frankly, if someone is this desperate for a sale, I’m not sure I want to go with them. Another set of stepping stones, and I end up in a little harbour part with, you guessed it, more bamboo boats. They all want my business, and the guy finally catches up with me and agrees on my starting price. But by this point I’m a good 10/15 minutes and 2 shaky stepping stone crossings away from his boat. I have no interest in going back for a boat ride that, if I’m honest, is sounding less and less enjoyable by the minute. Where’s the fun in going on a boat trip up a river by yourself? Maybe I was just being negative or penny pinching, but I just didn’t want to go with this guy, and it was clear he wasn’t going to let me on any of these boats even if I agreed to the price. Frankly it wasn’t worth the hassle, and I just wanted away from the river. Flee back into town via the market, and head towards the tourist information booths looking for information on the tours/shows I’d read about that I’d been interested in. However, when I asked about the Cormorant Fishing – I was told it required several people so I couldn’t go, and the same went for pretty much everything else. The few solo options had left early in the morning. The only things I could apparently do, were rent a bike, or go on a boat. Didn’t have the outfit for a bike, and at that very moment in time, going on a boat alone was the last thing I wanted to do. If I’d known so many of the options I wanted to do were group only I would have done the tour – sure, maybe I would have only done the bamboo boat and some sightseeing, but I would have had company and done some sightseeing. I wander along the river just looking for something else to interest me. But its pretty clear after the next 5 bamboo boat offers that unless you’ve got company, or are staying a couple of days or pre-booked a tour, Yangshou is not a place that offers much. At least not if you haven’t done any pre-plans. 3 hours later, I go to the bus station and hop on a Guilin bus home – 10 yuan less than the trip there and about 30 minutes shorter. The downside is it’s not the bus station I left from, so it takes me a little compass navigation and creative map work to get me back to a place I recognise. At which point I navigate back to my hostel and go upstairs to pack my bags so they’re ready for tomorrow. In a bit of a bum mood since the Yanshou trip went so sour. Thankfully I had some Ginger therapy in the bar, where Mr Adorable ended up sleeping in my lap for a good hour or 2. Really wish I’d been able to take more photos of the little sweetheart. I was mostly killing time until I could head out at night. 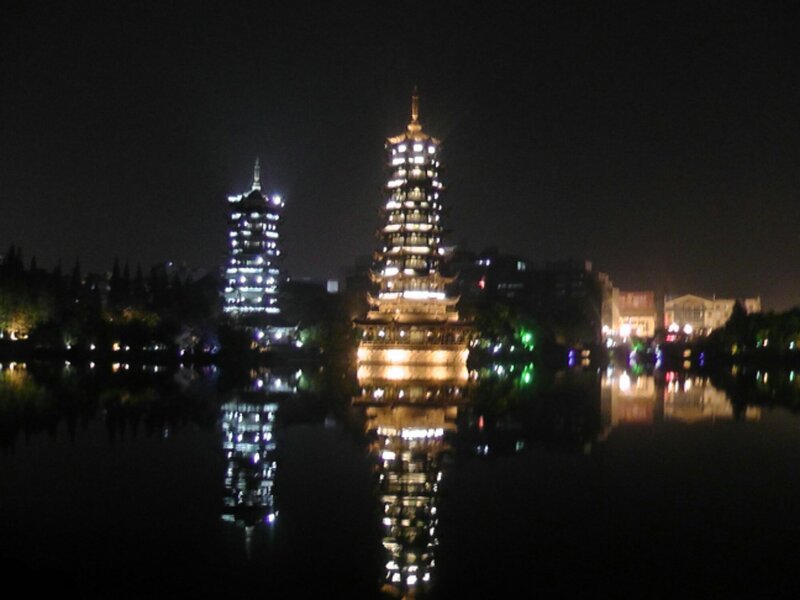 I was planning to go see the Pagodas (although decided against going inside) and then heading along to see Guilin’s night market. The hostel recommended it, and I did love Beijing’s and the Muslim Quarter in Xi’An. The pagoda’s were as awesome as expected, and as I was walking along the streets had a notion I’ve been holding for quite some time utterly confirmed. The Chinese want to live in musicals. And they love music in all its forms. I’ve seen the signs in all the places I’ve visited. Groups of elderly having dance lessons in parks and the streets, the mood and orchestral music beating out of radios in trailers or car stereos. And at night in Guilin, saw no less than 8 musical acts on the streets, most of which with some pretty fancy microphone and instrument tech. And all of them had crowds forming. On top of which? All of them were good – it was watching a rehearsal of ‘Voice of China’ (as far as I can tell, the Voice meets X Factor and on damn near constantly). 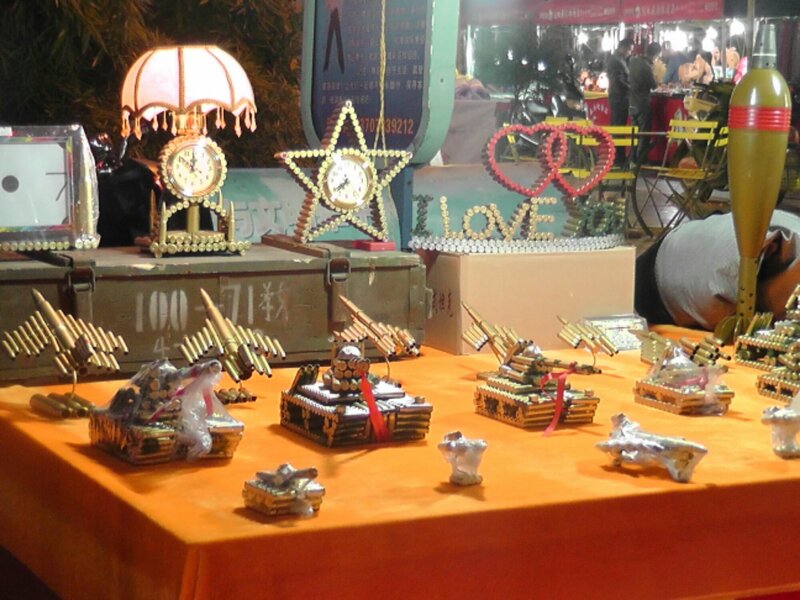 As for the night market, it was less food and more knick knacks. Most of them things I’d seen in the shops already so didn’t see much appeal. Although there was one stand that had something pretty spectacular – to the point that if I didn’t think I’d get arrested when trying to bring it into Australia, I might have snapped up. A gentlemen was selling models and pictures frames made out of bullet shell casings. Though the jet fighter and tank were glorious. Tomorrow mornings my last day in Guilin. Not gonna miss it, although the hostel has been great. Get the feeling I’m not going to do anything with my time other than lie in and play with Ginger though. 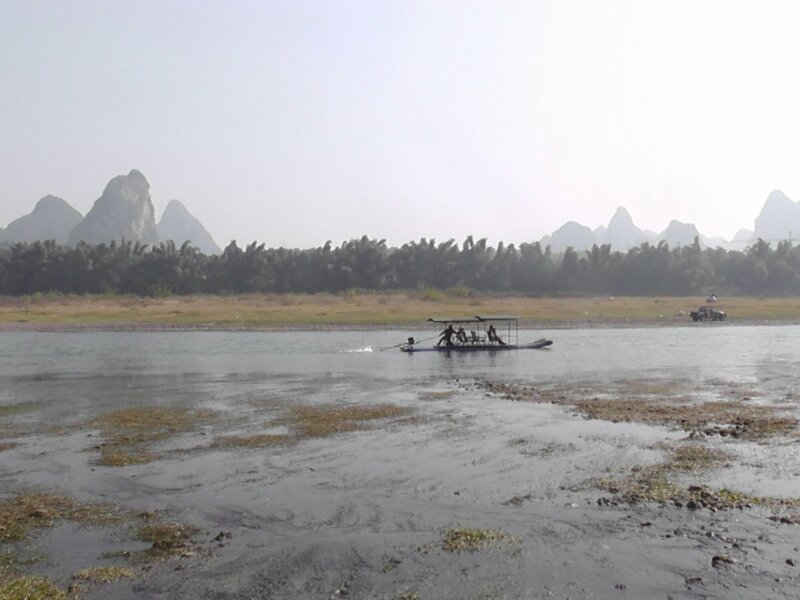 This entry was posted in China, Diary and tagged Bamboo Boat, China, Guilin, Yangshou. Bookmark the permalink.